This article was published in the print magazine Drupal Watchdog , Volume 3 Issue 2, 2013-09 , on page 15, by Tag1 Publishing. The magazine was distributed at DrupalCon Prague, 2013-09-23 . The Drupal.org site-wide search functionality is convenient, but the results are sometimes disappointing, with quality links missing from the first page of the results. As an alternative, consult the maestro of online seeking: Using Google Search, enter your desired search terms plus the modifier "site:drupal.org", which limits the results to those found on Drupal.org. 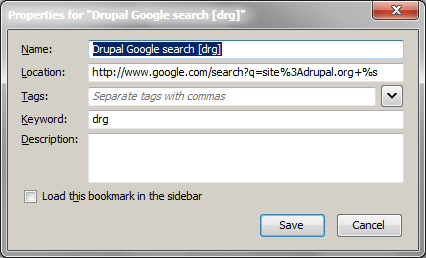 Even faster, for users of Firefox or Google Chrome, is to save the modified search as a bookmark with a keyword (in this example, "drg"), which can initiate the search right from the browser's address field. Really like what you have done [for my new web site].